(Nanowerk News) In an article published and featured as an Editors’ suggestion in Physical Review Letters last week ("Enhanced Magneto-Optical Edge Excitation in Nanoscale Magnetic Disks"), researchers from the Nanomagnetism group at nanoGUNE in collaboration with a team from the University of Cantabria and the University of Hamburg have reported on a massive increase of magneto-optical effects near the edges of nano-scale disks, where enhancements of over 1000% can be produced. The figure shows a secondary electron microscopy image of one of the nano-scale engineered samples consisting of 400 nm diameter permalloy disks that were fabricated by means of electron beam lithography. The center disk has the lateral distribution of the magneto-optical response superimposed as a color-coded image. The strongly enhanced edge-excitation of the magneto-optical response is visible as a yellow rim structure here. Magneto-optics is a crucial characterization and detection technique for materials and devices. Hereby, the technique benefits from its high sensitivity and its compatibility with almost any environment due to its contact-free nature. Recently, numerous efforts (also at nanoGUNE, see e.g. "Tuning the Magneto-Optical Response of Nanosize Ferromagnetic Ni Disks Using the Phase of Localized Plasmons" and "Ultrasensitive and label-free molecular-level detection enabled by light phase control in magnetoplasmonic nanoantennas") have been made to pair magneto-optics with plasmonics to achieve even higher sensitivities in designer materials or applications. 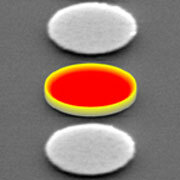 The present work now demonstrates that nanofabrication and nano-shape design allow for an increase and tunability of magneto-optical effects that is completely independent from optical or plasmonic resonances and thus not dependent on the photon energy of the exciting radiation, making it widely applicable. Specifically, this combined experimental and modeling study shows that in disk shaped samples, a magneto-optical response can be generated that is massively enhanced at the edges, leading to a “ring of fire” for the magneto-optical effect, as being shown in the figure on the right. In general, magneto-optical effects are caused by the quantum mechanical spin-orbit interaction and its influence on the electronic band structure. Correspondingly, magneto-optics is strongly associated with materials properties that result from the electronic structure. The influence of sample geometry onto magneto-optical effects on the other hand has so far only been associated with optical resonances, but resonance independent effects that originate from the specific self-interaction of the magneto-optically induced radiation pattern have not been observed. The reason for this is the fact that such behavior is extremely localized and thus only observable for small nano-scale structures. The work led by the nanoGUNE team has now succeeded in demonstrating that in such nano-scale structures, geometry induced effects can be extremely strong and they even can result in a doubling of the area averaged magneto-optical signal for a 100 nm diameter disk. Therefore, this new work opens up excellent nano-engineering opportunities towards enhanced and generally designed magneto-optical properties in nano-materials.